HandyCon 4 & 5- Big Update Incoming! We have a rather large and important update for you, so let’s crack on. ‘We promised you a huge announcement, so here it is. Today we launch HandyCon 4: The Fourth Awakens AND HandyCon 5: Revenge of the Fifth. 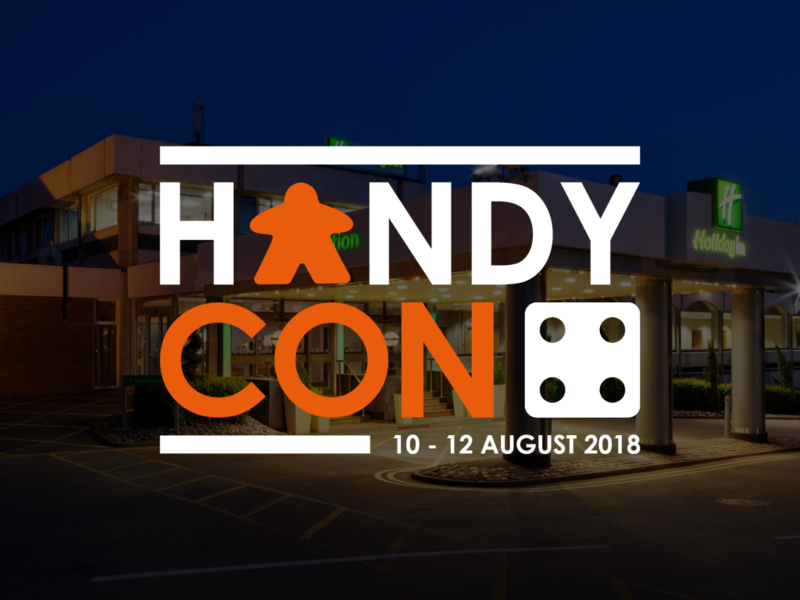 We are delighted to announce that HandyCon is moving, 10 miles down the road, to the Holiday Inn, Maidenhead on 10th August 2018. We are very grateful to High Wycombe for allowing HandyCon to grow into what it has become, certainly not something that we predicted 18 months ago, but we had to turn people away from HandyCon 3 and felt the time was right to move to a bigger venue. Maidenhead can comfortably sit more gamers, in a less crowded space and allow us to continue to run the events, Bring and Buy and give access to our Games Library so that even more people can enjoy the HandyCon experience. Adding to that we have lots of ideas to make this HandyCon the best one yet, sticking to our mission of making HandyCon about gaming and inclusion, making it as easy as possible for people to get a game throughout the weekend. Tickets to both HandyCon 4 (10th-12th August 2018) and 5 (18th-20th January 2019) will go on general release on Friday, using our new ticketing system on the HandyCon website (www.handycon.co.uk) These will include full use of the games library, free tea and coffee stations throughout the day, free games tournaments with prizes, access to a huge Bring and Buy, Free parking and many other soon to be announced features and attractions. We are working hard with the hotel to provide a quality and varied menu that caters to all needs at an affordable price and will keep you posted as the date gets closer. You can purchase tickets on our website. Note that we have a new ticketing system that requires you to name each attendee and add their email address. Tickets will be emailed to the purchaser and to individual attendees. Please bring your tickets (in printed or digital form) along to the registration desk on your arrival to collect your passes. Note that if you do not have your ticket we will need you to show some form of ID. We have also updated our Terms and Conditions, which can be found here. For those of you wanting to stay on site, the Holiday Inn Maidenhead have now opened bookings for HandyCon 4 and HandyCon 5. All room rates include breakfast and have a £5 double occupancy suppliment. The hotel also offers use of the health club and swimming pool for those who fancy a game of _insert aquatic game based pun here_. These room rates are available from Thursday to Sunday night for both HandyCons, so you can stay the night before and the night after the con at the special rate. Rooms can be booked online using the Group Codes (found under the ‘More Options’ toggle on the bookings page) ‘HC4’ for HandyCon 4 and ‘HC5’ for HandyCon 5. Alternatively you can call the hotel on 01628 506070 and quote the above codes. Although the total accommodation available on site has increased, we advise booking early to avoid disappointment. We hope to see you all in August and January!